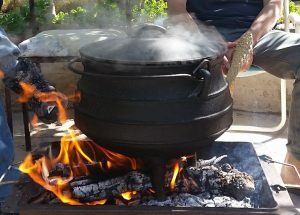 Cooked for hours in a three legged cauldron over open fire, this popular South African dish is served with rice or pap. The cauldron comes in many different sizes, for example; little enough to be used as a serving dish for 1 person at a restaurant, or large enough to feed a group of say 110! For reals. I think I invested in a size 3 and have comfortably fed 13 adults, some had seconds and I had leftovers. Every winter I make this at least once, and usually it turns into a “invite anyone who has never had it” kind of shindig. In South Africa many years ago we used to have Potjie competitions, families would plan upfront, pack picnics, blankets, frisbees and spend a day outside. Family patriarchs will have their secret sauces and magical ingredients stored under a tablecloth and all at once there will be like 20 of these pots being cooked around the park grounds. When I was little I didn’t get it, I was such a picky eater, I couldn’t understand what the fuss was about, even if my own dad would win or get a top 3 prize, the family would be so happy and proud. Anyway he died before I learnt to appreciate his potjie, and way before I started cooking. Fastforward 15 years, by then I’ve eaten a fair share of potjies and still none have blown my mind – I go to a Potjie hosted by my much older brother, and WHAM… flavours of my childhood come racing to my mind, of days spent playing with other kids, running, laughing, the air smelling like smokey fires and meaty stews. NOW I get it. Lucky for me, and now you, my brother watched, and learnt and listened all those years ago, how my dad cooked his winning potjie, and now after a few years of DIM(doing it myself) I am able to digitise a slightly altered version of our family recipe for anyone to try – to follow in a week or so, when I make it.